Have you ever played a bad half and had difficulty bouncing back? Does a bad game affect how confidently you play the next game? Bouncing back from a poor performance requires a resilient mentality. Resiliency is the ability to recover from tough times. Resiliency is like being elastic (quickly regaining your form). The same is true of a resilient soccer player. 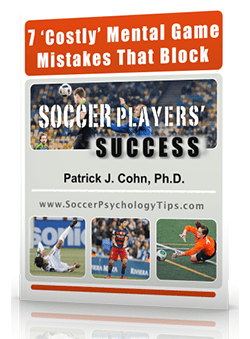 Great soccer players spring back after a mistake or poor performance. 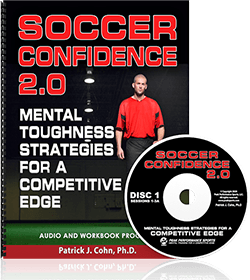 You starting thinking negatively, “I just can’t seem to find the back of the net” and your confidence starts plummeting… One bad game leads to more poor performances. The solution is to “let go” of past plays and performances. By “letting go,” you will be able to “recover” and regain your form. Jozy Altidore is a 24 year-old striker, who has played professionally since 2006 and made his US National debut in 2007. Altidore recorded goals in five consecutive matches in 2013 to help the Americans qualify for the 2014 World Cup. This season, Altidore had a difficult time playing in his first year for Sunderland and the elite competition of the English Premier League. Altidore scored only two goals for Sunderland and had his playing time reduced. Now, as the US squad prepares for the World Cup in Brazil, Altidore’s is attempting to “let go” and bounce back from his poor performances and contribute to the success of the US team. Altidore realizes that a resilient mentality is the hallmark of great soccer players. Keep in mind that you are not perfect and everyone has a bad game. One bad game doesn’t mean the next game will be bad, unless you allow it. Remind yourself of times when you recovered quickly from a bad game. Stay focused on your strengths, play your game and immerse yourself in the present moment. Focusing on your strengths can boost your confidence. 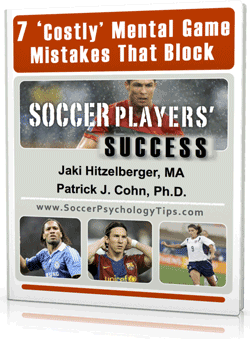 How many years have you (or your players) devoted to developing your soccer skills? Now is the time to dedicate time and commit to develop your mental game. I really need help with my mental game. I play pro and been out for 2 months played my first game today and it was really a mess..I am very embarrassed and made mistakes. I never make. I dont know why. My head ended up being lost.